Coyotes in New York and Chicago: Urban ecology of rats, geese, deer, feral cats. Coyotes may be wily, even virtually invisible, but they’re changing our cities. 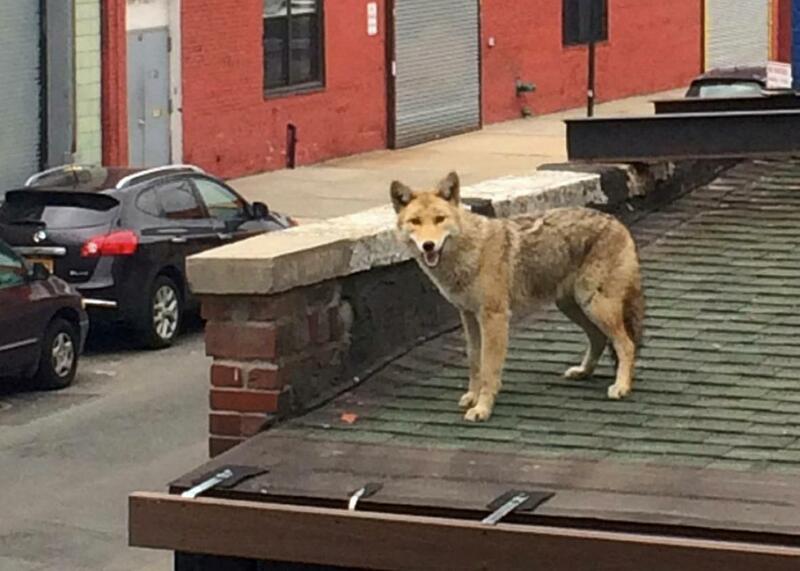 A coyote spotted on the roof of L.I.C Bar on Vernon Blvd. in Queens, March 30, 2015. In January of this year, near Stuyvesant Town in Manhattan, a coyote stalked the streets around a Con Ed power station until it was captured, given the unlikely nickname of “Stella,” then released into the Bronx. In March, a coyote taunted photographers from the rooftop of a bar in Queens, running back and forth before vanishing. (He didn’t pay his tab, the bar owner joked.) In April, a coyote wandered through Battery Park City at the southern tip of Manhattan, checking out the neighborhood until it was tranquilized by police in an outdoor cafe. Also in April, police missed a coyote in Manhattan’s Riverside Park; it bee-lined north toward Grant’s Tomb; a woman told the New York Times that the last time she’d seen such a commotion was when a naked man terrorized the neighborhood. When I think about these stories, which I’ve amassed in a file of newspaper clippings, I imagine a giant game of Pac-Man overlaying the New York grid: Coyotes roam the streets on a hunt for sustenance, and we are the colorful ghosts to be avoided at all costs. Any coyotes that encounter a human lose the game; winners are the ones we never even hear about. Originally, I began collecting these coyote stories because they were amusing and strange. Over time, though, I’ve come to realize that they say something revealing about the way we understand the natural world. All of the sightings added up to a “coyote invasion,” the New York Post declared. Coyotes were getting “more and more brazen,” said Gawker. They were here to “take over New York’s swanky neighborhoods,” and were yet one more sign of a “great human vs. animal war.” Of course, many of these reports were written with a generous dose of humor, but they nevertheless spoke to a widespread belief that coyotes (and wild animals generally) don’t really belong in our civilized domain. Wild animals are an aberration, to be marveled at and then segregated off in what one government authority, after a particularly vivid pursuit, termed an “appropriate wilderness area.” We live here, the reasoning seems to run; you live over there. This belief rests on an unstable bedrock of fallacies, and for several important reasons we need to revise our ideas about where wild animals actually belong. Instead of dismissing coyotes as curious oddities, what if we considered their ecological value? Could a 40-pound coyote benefit an ailing urban landscape? Does New York need its coyotes? According to Mark Weckel, a conservation biologist who co-founded the Gotham Coyote Project, coyotes have actually been around the city for longer than most people realize. The full history of the northeastern coyote is long and complicated and genetically murky, involving cross-breeding with wolves at some point, which is why they are sometimes called “coywolves.” But the general scientific consensus is that they come from the American Southwest and Great Plains regions, and that they expanded their range across the Mississippi and around the Great Lakes in response to humans eradicating other predators (like wolves), and opening up the landscape with farms. Coyotes were probably first sighted in New York state as early as the 1920s; around the 1940s they established a foothold in the Adirondack Park. By the 1980s, they were appearing in tony Westchester County just north of the city, making them the ultimate social climbers. In 1995, somebody first reported one within the five boroughs, a territorial expansion that is “fantastically rapid,” Weckel explains. Today coyotes live throughout much of the Bronx—“the north, the west, the south, the central part”—and they get around along railroad tracks, abandoned industrial sites, and the sides of highways. As it stands, most of what we know about coyotes in cities actually comes from Chicago, which is home to one of the most surprising, revealing, and long-running urban fauna studies in modern American history. Fifteen years ago, Stanley Gehrt, head of the Cook County Coyote Project, radio-collared his first female coyote, and quickly realized that “pretty much everything we thought about them was wrong.” Gehrt had assumed, for example, that coyotes would only live in large parks around the periphery of Chicago. Yet on his very first night of tracking the animal, she left the park where he’d caught her and headed for O’Hare. “When I caught up she was on a little patch of ground in between an interstate and a subdivision,” Gehrt recalled. Three men were standing nearby with their dogs, “she’s only 10 yards away, and they don’t even know it.” The coyote never returned to the park. She lived in the neighborhoods, became an alpha female, raised about 70 pups in total, and died of natural causes at the advanced age of 12. “One surprising fact after another,” Gehrt says. This was just the beginning, though. Despite the fact that monitoring rodents is far more challenging than geese, studies by other researchers in rural areas have suggested that removing coyotes causes rodent populations to swell. Gehrt and his team have just completed a large-scale feral cats study, which found that coyotes are repelling them from natural areas within the city. “That has a positive impact on native fauna,” Gehrt says—cats kill a lot of birds. Recently, researchers at the Illinois Natural History Survey have also been considering white-tailed deer, which are responsible for a remarkable number of automobile accidents; findings suggest that coyotes are making a dent in their population through fawn predation. Out of 15 fawns collared this season, Gehrt says 11 have already been taken by coyotes. All of this would seem to be good news for the New York metropolitan area, which could certainly use a better form of rodent control than dangerous poisons. Even a fraction of the effects seen in Chicago could help restore biodiversity, enrich parks, and counteract decades of environmental damage. But as I contemplate those news reports, I also have in mind another kind of value. Could coyotes, their sightings so vivid and impossible to ignore, help us overcome the misguided belief that humans and nature are separate? “We need to discover a common middle ground in which all of these things, from the city to the wilderness, can somehow be encompassed in the word ‘home,’ ” William Cronon, a professor of American environmental history, once wrote. Weckel raised this idea himself when he was discussing the Gotham Coyote Project: “I would argue that in our particular period of time, coyotes could actually be more championed as a flagship species for urban environments.” He pointed to the kinds of words newspapers are using to describe coyotes in New York—invade, unnatural, strange. “Those are things that we have to address,” Weckel says, “because if all of a sudden we don’t look at these sightings as unnatural and strange, that means we begin to think of cities and ourselves as part of the larger environment.” Urban coyotes might represent an icon to help encourage greater ecological consciousness. At any rate, coyotes are not going anywhere, so we have no choice but to adapt to our new neighbors. Consider, for example, that the U.S. Department of Agriculture’s Wildlife Services kills tens of thousands of coyotes every year (61,702 of them in 2014), largely—and controversially—at the behest of livestock ranchers. Coyotes respond to this annual siege by expanding their range and breeding even more furiously. There are now coyotes in North America everywhere from tropical climates to the Canadian sea ice. Long Island is an inevitability. Coexisting will probably never be easy, or even particularly straightforward. But perhaps in the grand scheme of things, living with coyotes, compared to other kinds of predators (grizzly bears, say), is relatively tame.